I have been speaking on university campuses across America for more than 20 years. By my count, I have appeared on 215 different university campuses. I can address the issue of freedom of speech on campuses from firsthand experience. I have been canceled, obstructed, and, on more than one occasion, hecklers have tried to shout me down. What I find distressing today is that the situation is getting worse. The theme is consistent. It is the left, operating under the pretense of fairness and freedom, that is the force of obstruction and intimidation. It is the left that works, usually starting from the office of the sympathetic president, to shut down dissent and alternative points of view. I was invited this week to speak at the Young Americans for Freedom organization on the campus of California State University, Los Angeles. The topic: "Abortion: Planned Parenthood's War Against the Poor." As soon as posters appeared on campus advertising the event, left-wing students ripped them off the walls and replaced them with pro-abortion, pro-Planned Parenthood advertisements. When a YAF member captured them in action on video, and asked why they are tearing down posters, the response was profanity. The YAF Facebook page advertising the event was invaded with more profanity and racial epithets. More than 90 percent of the student members of Cal State L.A. YAF are blacks, Hispanics and Asians. Conservative columnist Ben Shapiro and the head of Cal State L.A. YAF are suing Cal State L.A. for costs incurred as result of the violent obstruction of Shapiro's appearance earlier this year, speaking on the subject "When Diversity Becomes a Problem." University of Chicago Dean of Students Jay Ellison attracted attention recently when he explained in a welcome letter to new students the genuine commitment of the college to free speech and academic freedom. "Civility and respect are vital to all of us, and freedom of expression does not mean the freedom to harass or threaten others." Should this be controversial? Unfortunately, Dean Ellison should have sent his letter to the president of Cal State L.A. and many other university presidents across the country as well as to his new freshman. 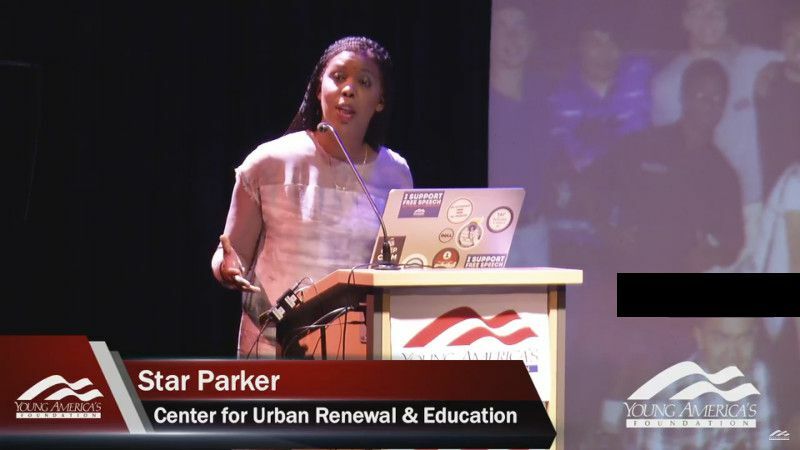 The YAF video shows that the students tearing down the posters for my event were black. The slurs posted on the Facebook page includes the following: "welcome to America the country that is run by straight cis white males that believe abortion is cold murder but killing black people is not." Of course, I am black. As are the many conservative black pastors across the country with whom I work who share my profound concern about what abortion is doing to black America. According to data reported by Right to Life Michigan, compiling data from the Centers for Disease Control and Prevention, "more than 16 million black babies have been aborted" since the Roe v. Wade decision in 1973. Although black women represent 14 percent of America's female population, they account for 36.7 percent of all abortions performed. In addition to our concern about the scourge of abortion, black Americans, like myself and the many black clergy with whom I work, are also deeply concerned about the chaos gripping so many of our urban areas. Perhaps if these young black leftists were capable of humility, and would take a moment to think and learn, they would see the connection between this chaos and the lack of respect for life that a culture of abortion-on-demand encourages. But how can we expect such awareness from young people when the presidents of the universities they attend don't understand or care about it?